Two contracts have been awarded to purchase new and retrofitted CH-47F's. On April 14, 2016 the US Department of Defense awarded Boeing a contract to build 12 CH-47Fs followed by an additional order on April 28, 2017 for two new CH-47F's and the retrofit of the six CH-47F Chinooks already in service (D-890 - D-895). The contract between the Dutch MoD and Boeing was signed earlier following the approval by the DSCA of the sale of the 17 Chinooks through the Foreign Military Sales (FMS) system on March 23, 2015. The new Chinooks are build to the same standard as the current US Army CH-47F's, MYII CAAS (Common Avionics Architecture System) with limited Dutch specific adjustments containing crash-proof seats in the cockpit and a VHF radio (very high frequency) for secure communication with Dutch units. They also receive the fast rope system for special forces operations. FLIR (Forward Looking InfraRed) is not (yet) installed on the helicopters.. 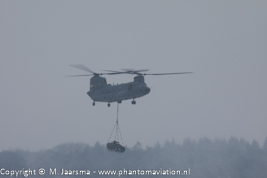 The first new Chinook is expected to arrive at Gilze-Rijen at the end of 2020. In mid 2022 the transition to the new CH-47F should be completed. Both Chinooks (CH-47D green and CH-47F grey) at Gilze-Rijen Sept 7, 2016. 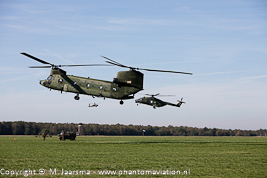 The CH-47D's arrived in The Netherlands from 2005 these consisted of six new build helicopters and seven Chinook bought from the Royal Canadian Air Force (RCAF). 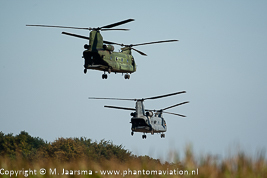 These were retrofitted and brought to the CH-47D standard before being delivered to the RNLAF. Two Chinooks were lost in Afghanistan. Six new CH-47F were ordered in 2007 when the contract with Boeing was signed. Four of these Chinook were bought to expand the existing, scarce capacity and the other two to replace the lost CH-47D's. 298 squadron is based at Gilze-Rijen, 302 squadron in the USA at Fort Hood, Texas. 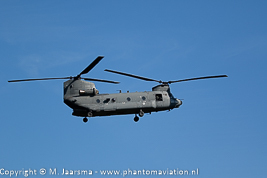 22-03-19 The two CH-47F's departed Gilze-Rijen by road to the port of Antwerp (Belgium) for transport to the USA. to be delivered by July 30, 2021. 14-04-16 US DoD awards Boeing the contract to build 14 CH-47F's to be delivered by December 31, 2020. 7-9-2015 The minister of defence announced to purchase 14 new CH-47F MYII CAAS. 23-3-2015 DCSA approved the possible sale of 17 CH-47F Chinooks. Sep '13 Delivery of the last CH-47F. 2007 Contract signed between Boeing and the Dutch government for the purchase of six new CH-47F's. 1998 Delivery of the new build Chinooks. Aug '95 - Feb '96 Delivery of the retrofitted Chinooks. Dec. 1993 Decision taken that the Chinook fleet would consist of six new and seven retrofitted aircraft. Early 1993 Contract signed between the Canadian and Dutch governments for the delivery of seven CH-47's to the RNLAF. CH-47D training at the slopes at its home base Gilze-Rijen Oct, 15, 2018. CH-47F on approach to Gilze-Rijen, Sept. 7, 2016. 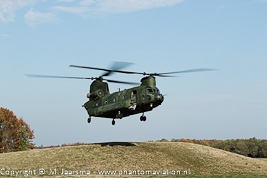 CH-47D in action at Deelen during exercise Falcon Autumn Oct. 5, 2018.